Appearance – Pours with a massive tan head (that occupies about 4/5 of the glass), way too much carbonation obviously and that’s pouring the beer right out of the fridge and into a wet glass. 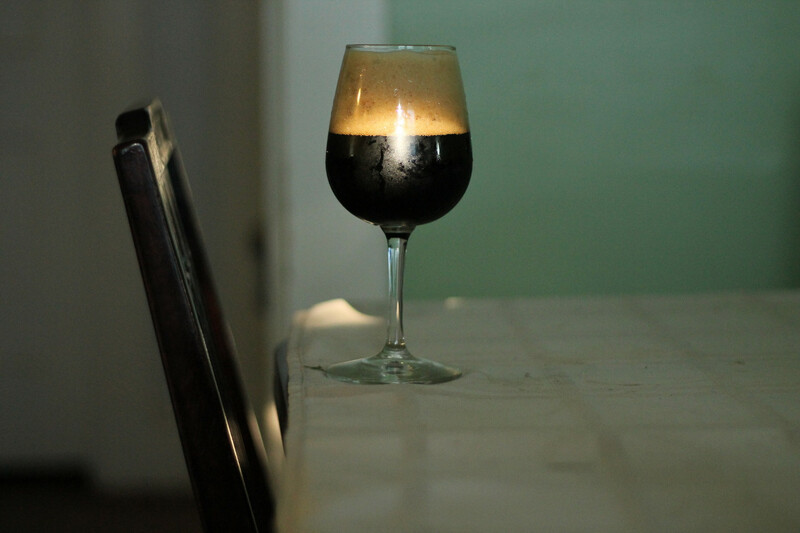 Once and the pitch black body regains its proper proportions, it’s an attractive beer. Smell – Cinnamon and charred oak lead with some biscuity malt, like a slightly over-cooked cinnamon bun. There may be a slight fruitiness from the yeast, but it is hard to put my finger on it, maybe just my imagination. There is some clean ethanol as it warms, but not unexpected for a beer with this strength. Smells very fresh, no sign of oxidation despite the time spent in the small barrel. Taste – The flavor is similar to the aroma, although the cinnamon waits until the finish to peak. The body has the flavors of a big sweet beer, but not the sweetness. The vanilla helps to cover-up for the dryness. Not terrifically complex. I don’t get a varietal barrel character, but there is certainly some American oak. Mouthfeel – Carbonation is still too high despite my waiting for the head to sink and a photo session that combined for about 10 minutes of waiting. Body isn’t entirely thinned out, but it doesn’t sell the beer as a thick sipper. Drinkability & Notes – The nose is a hint at what this beer should have been. What is amazing to me is that while sitting in the barrel for two months the residual Belgian yeast didn't give any indication of what it was waiting to do in the bottle. I’d usually suspect Brett, but other than the lack of sweetness and high carbonation there isn’t any evidence of the responsible microbe. I poured most of the rest of the batch into a CO2 purged keg, maybe I’ll dose it with some maltodextrin or lactose before I tap it next fall. In the future, if I want to age multiple clean beers in the same barrel, I'll ferment them with the same yeast strain! I bottled a Biere De Noel about 3 months ago with a Cinnamon and Vanilla extraction. Let me confirm for posterity, Cinnamon is about twice as potent as you would expect. It does however fade with time. I got a gingerbread cookie that was tasty but unexpected. I aged two clean beers back to back in a 5G barrel recently. The first beer was WL001 and the second was fermented with an English strain. I'm assuming I didn't notice any differences because of the strains chosen. If anything the secondary strain would have produced more noticeable esters the the primary strain. I think you might have been fine if you had brewed using Belgian strain second rather then the porter. I added some lactose to a basic stout recently after I way missed my mash temp and it came out super dry. Worked perfectly. No sweetness, just fullness. Only downside was all the self-kicking I did afterwards for it taking me a week to think of it.